The Belko Experiment was written by James Gunn and directed by Greg McLean. It is a horror-thriller set int an office building. Many people have made the comparison of this being Office Space meets the Purge, and that is a fair assumption. Belko is a corporation that worked to export American jobs with American workers into other countries…or at least, that is what they were told. In reality, Belko was setting the stage for a social study on the nature of humans placed in a violent, no-win scenario. There are 80 employees of Belko and they find themselves trapped in their office building after blast doors seal the building tightly. Then, a voice over the intercom states that if they do not kill 20 of the people, they would kill double that number, and then they proceed to show their strength by blowing up the chip that was placed (as a way to protect the employees from kidnapping) in each employee’s head. Of course, this was causing quite the panic among the employees and it did not help when the CEO of the corporation, Barry Norris (Tony Goldwyn) decides that the only way to go was to follow instructions. The Belko Experiment is a mixed bag. While it is a fascinating concept for a horror-thriller, the actual execution in many senses are lacking. The idea of normal people having to choose what to do in an unwinnable situation is an interesting set-up, but it was not really followed through with in any specific manner. The social study aspect of the story was touched on, but not developed enough to make this a psychological thriller. The other major issue hurting this film was the lack of any sort of character development for most of the characters on screen. These characters were basically disposable characters you might find in a slasher movie, with perfunctory introductions and, maybe, a few seconds to let the audience know who this person is. It was not enough to really build the kind of connection to the characters so, with most of these characters, you don’t care much when they are killed. Sure, you feel bad generally because it is sad to see people killed, but the emotional beat is severely lacking for most of these characters. There are a couple of exceptions. Michael (John Gallagher, Jr) is our main protagonist and is the character we spend the most time with. He is also the one who wants to find a better way of escaping this trap than following instructions. He is the voice of reason within the chaos of the story so he is easier to relate to than the rest. The other character that I felt a connection to was Evan (James Earl), the security guard who was given quite a bit to do early in the film, and who showed his strong moral fiber in the face of the horrible situation. I hated Tony Goldwyn’s character, who became so unhinged that he became downright stupid. There was a situation at the end of the the story that I will not spoil, but had the character done what I would have done, things would have turned out differently. Even worse was John C. McGinley’s character of Wendell, who we were introduced to as a creep and who never had any redeeming qualities at all. He just became someone who I wanted to see die, and movie characters like that are not really characters as much as they are plot conveniences. I also hated Michael’s girlfriend Leandra (Adria Arjona) who seemed to be desperately inconsistent as a character. Having said all of this, I did find myself reasonably engaged with the film and I was anxious as the story continued. It turned more into a gore fest with some brutal scenes of blood and death than any sort of social experiment. That is fine, and if you approach the movie with that understanding, I believe you could really like The Belko Experiment. It really felt like the film wanted to be more but it settled for the lowest possibility instead of reaching for something better. The ending of the movie was pretty anticlimactic as it really just sets up the sequel rather than serving as a message or a theme. 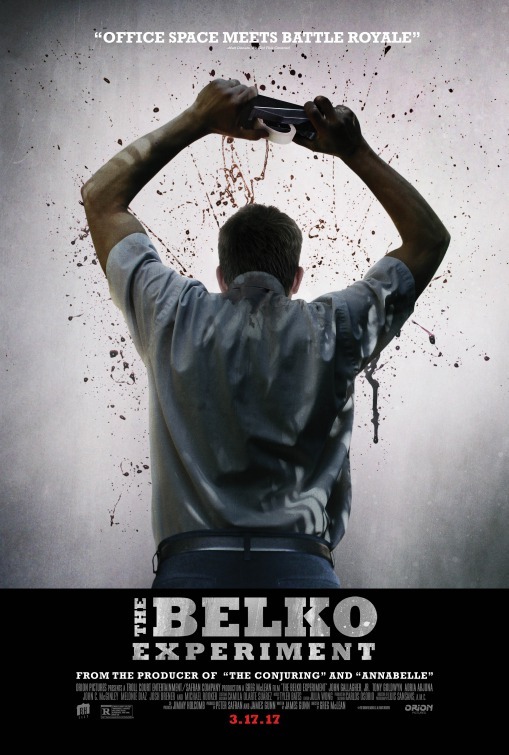 The Belko Experiment was one of those films where I walked out of the theater entertained, but the more I thought about the movie, the more of its flaws started to surface. If you are looking for an intelligent, psychological thriller that has a message to share with the world or a satire of the cutthroat world of business, well this film is not for you. If you want a potential guilty pleasure horror-thriller where disposable characters are disposed of in gruesome manner, then The Belko Experiment might just be what you are looking for.